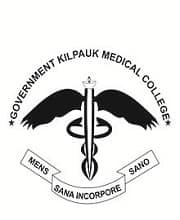 Kilpauk Medical College, Chennai (GKMC Chennai) is one of the Oldest Medical institutes was founded in the year 1960 run by Govt of Tamilnadu. It is affiliated to The Tamil Nadu Dr MGR Medical University and approved by Medical Council of India. Kilpauk Medical College offers a various course in Undergraduate and Postgraduate level. Before we go to complete college review, let us have a look at the major details of Kilpauk Medical College, Chennai. In this article, we will provide you with the detailed information about Kilpauk Medical College, Chennai Fees Structure, Course offered, Admission Procedure, Placement Stats, Cut-off, Facilities available and complete college review. Admission Seekers must fulfil their MBBS NEET Medical Entrance Exam Scorecard. Age: 17 years or above as on 31st December of the year of admission. It is one of the premier Medical College in Tamilnadu. We would like to give 4.2 out of 5 stars on Edufever Best Medical Colleges in Tamil Nadu. For further admission related queries, despite you can comment on the box mentioned below. Our top expert will serve you with the best possible solution. Admission will be based on NEET 2019 exam only.